Do you wish to restore the good look of your windows fast and efficiently?Are you seeking for techniques of effective window washing? If yes, you have come to the right place! 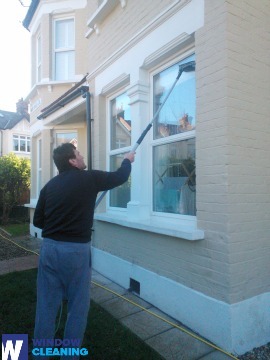 With the experts of window cleaning in Southfields, you will successfully bring back the daylight into your house. You will enjoy impeccable glass surfaces as well as completely clean framework and ledges. You will be able to use your newly-acquired free time as you desire while we shine the glass surfaces of your home. You will not only stay away from this tedious and demanding work – our services will additionally give you some delightful profits. We also provide our professional services in nearby areas: Wandsworth, Earlsfield, Putney, Leaves Green, Bromley Common. We provide residential and business window cleaning by using advanced techniques. You can rely on our expertise for all types of glass surfaces, skylights and greenhouses. For windows placed up to your fourth floor, we use water-fed extension poles. This technique is convenient and allows risk-free cleaning process – the poles are connected to the water reservoir in the vehicle. For higher windows, our rope access solution will grant you fast and effective end results. You can profit from these methods right now – just dial 020 3746 3113 and place an order! You can depend on the abilities and competence of the professionals for cleaning all kinds of windows. The glass surfaces in our expertise are: small or double windows, sash ones and bay windows. Of course, if you have garden windows, French doors, greenhouse or skylights, we will make them spotless, too. With our advanced ways of working and latest equipment, we can deal with all types of window cleaning, even with hard-to-reach glass panes. You can be certain that the good look of your business property is guaranteed. The specialists will will fulfil your need of second-to-none commercial window cleaning. With our water-fed extension pole equipment, you will receive swift and perfect washing of all windows as high as the fourth floor. For high-rise buildings, we put to use our rope access equipment. It is our advanced method of reaching glass panes on taller buildings. No matter what is the size of your business premise – a humble corner shop or the Shard – we will leave a pristine look of your windows. Take advantage of our residential window cleaning in Southfields – we provide great services for your home on affordable prices. We use purified water to clean the windows completely. We clean from the ground with water-fed pole technology. Talk to us now - ring 020 3746 3113 or just use our booking form. Our operators will help you place an order and answer all of your questions. You will be delighted by the results of our household services, we assure you to that!